Racial diversity is the story of America, our triumphs as well as our faults. Yet racial inequality is not a topic we readily discuss. It’s time to start. Conversation has the power to change hearts and minds.​ At Starbucks, we’ve seen this firsthand. Recently, as racially charged events unfolded across our country, we felt a responsibility to act…. In forums from Oakland to New York to Chicago, as well as St. Louis, people shared personal experiences and ideas about how to move our country forward. 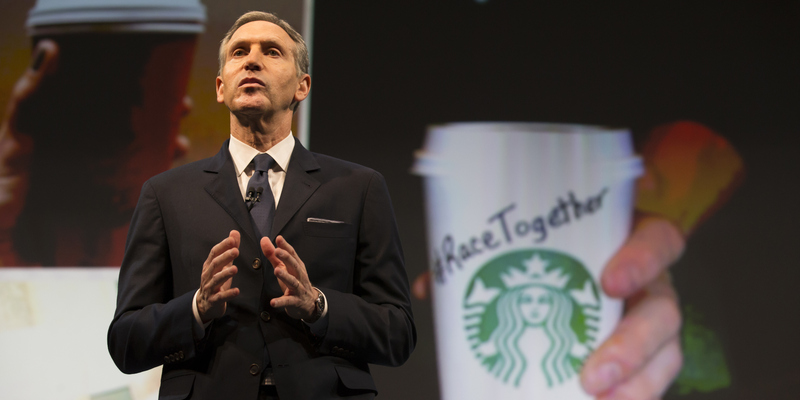 It may not be mentioned in this article, but I believe a murder in Milwaukee last April was the critical incident that triggered Starbucks’s consciousness on race relations in America. A year ago this month, Starbucks was directly involved in a case where a Milwaukee police officer fatally shot an unarmed mentally ill man fourteen times. What role did Starbucks play in this fourteen shot tragedy? On April 30 of last year, barista Kelly Brandmeyer went into her Starbucks at Red Arrow Park in downtown Milwaukee for her noon–7:30 pm work shift. The regular Starbucks location was undergoing renovations, so Brandmeyer and her co-workers reported to a temporary trailer in the park where Starbucks set up shop. Brandmeyer had no idea that during her shift she was going to witness firsthand the fatal shooting of Dontre Hamilton by a local police officer.